Don’t have any plans for your Friday afternoon? Well lucky for you Leadership will be hosting a movie night in the small gym after school on Friday, March 15 at 4pm. 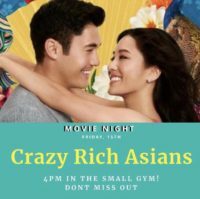 The movie they will be playing is “Crazy Rich Asians” by director Jon M. Chu. Entry to watch the movie will be free to all students, although concessions such as snacks and beverages will be sold. Kristina Jinanian, PAM senior and leadership fundraising chairman says, “You cannot find this movie on any other streaming site…We hope people show up and have fun..”. With the grading window finally closed, what better way to relax and distress from all that work, than by sitting back and watching a free movie with friends. United Teachers Los Angeles says its members have overwhelmingly voted to authorize a strike against the Los Angeles School District should one become necessary. Why you may ask? Well, UTLA have made several demands and LAUSD has rejected any proposals the Union is offering. 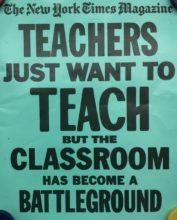 UTLA has requested an increase in staff wages, class size reduction, counselor-to-student ratio increase, and more funding in community schools and have been turned down every time. UTLA believes these are reasonable demands considering LAUSD has over $1.7 billion in unrestricted reserves.